The Tustin, California monthly Flea Market, a.k.a. The Jamestown Vintage Flea Market is a favorite of Billy Blue Eye because it really is a neighborhood event. Each month we expect to see some familiar faces and spend some time sharing tales of what has occurred in each of our lives since last months’ event. It is also through these exchanges that one can deepen one’s appreciation for whatever collectible you might be addicted to. For a young collector this is an important experience, almost a right of passage. Collectors will tell you that most often their own collecting was a direct result of hearing about how it enhanced the life of another. Their interest and curiosity was born and stimulated the beginning of their own collection. I enjoy sharing tales of my early days of pottery collecting. 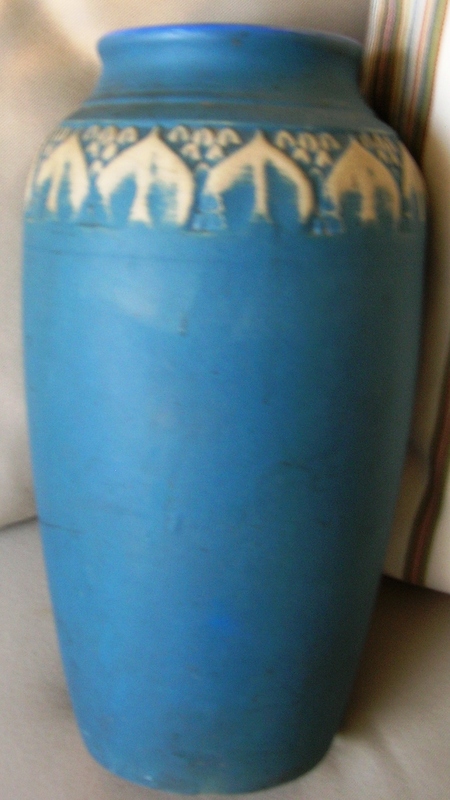 It was in 1982 that I was bitten by the “pottery bug”. 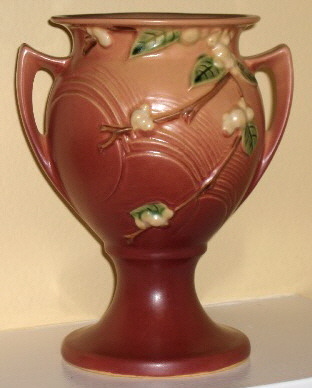 A lovely Roseville Snowberry Urn found its way into my hands at a Milwaukee, Wisconsin antique barn and after agonizing over spending the $35.00 that it cost, it found a permanent place in my home and in my heart. So if you’d like to stop by and share your own tale of collecting we can be found tomorrow, Sunday, May 22nd at the Tustin Flea Market, 474 El Camino Real, Tustin from 8:00 AM until 3:00 PM. Space #45. We hope to see you there neighbor. I have the exact same case in great condition. I am looking to sell it. Are you or anyone you know perhaps interested? Thank you for asking, but we’re not interested. Good luck!